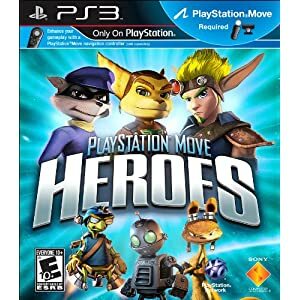 PlayStation Move Heroes is a game which uses the Playstation Move, and also features characters from several previous popular Playstation franchises by Sony, including Rachet and Clank, Sly Cooper, and Jak and Dexter. In all honesty, the game’s weak storyline has little to do with any of those three franchises–Sony obviously just conveniently brought them all together in an obvious hope to get existing fans of all three franchises interested in the Move. I wouldn’t call Playsation Move Heroes an exercise game per se, nor would I call it a platformer in the sense that the three games from which the game’s heroes come from are. Still, it is a great representation of what is possible with the Sony Move. The implementation of Move controllers is phenomenal, and again shows how the Move’s precision is far superior than the Wii or even the Xbox Kinect. The game consists of mini-games which take you through each respective Heroes’ world. The games are all “first person shooter” point of view, where your character runs through the worlds. I’d say that the Navigation controller is a must-have for this game, as you’ll be controlling the characters’ motions using the joystick–it’s possible with the Dualshock but not nearly as comfortable. Within the game you’ll wield various “weapons”. – The Whip – This is an electronic “whip” which you’ll use Indiana Jones-style to whip enemies (mainly clueless-but-vicious robots), as well as grab them and use them as objects to bowl over other enemies and objects. – Bowling – Here, you wield an explosive bowling ball which will bowl over everything in its path before you detonate it by pressing the Move button. While it ball is in motion, you can control it using the Move controller with unprecedented accuracy. – Sword – This game feels a lot like the swordfighting game in Sports Champions. Again, you’ll face off against robots by wielding the sword. The motion controls again are one-to-one and extremely precise. -Flying Disk – Here, you flick a flying disc like a frisbee (as in Sports Champions, you hold down the trigger button and release it as you flick your wrist). As with the Bowling weapon, you can control the trajectory of the disc as it flies through the air with your Move controller and detonate it with the Move button. – Gun – A good old fashioned shooter where you hold a gun and blast everything in your path. Great for releasing stress. I’ll be honest, the storyline is not even worth talking about–it’s some weak premise not even worth trying to describe here. But the star of the game are the motion controllers, which really show off the capabilities of the Move, and where the Move currently excels over the Wii and the Kinect, i.e., in its precision, if not in its immersion (Kinect) nor its overall fun (Wii). The co-star of the game are the graphics. They’re rendered in beautiful high definition (720p) and do justice visually to each of the franchises it’s borrowing its characters from. If I had complaints about the game, it’s just that the first-person element of the game can be a bit confusing and even nauseating at times. It takes a lot of getting used to it running and then trying to turn towards the enemy when one is close (you supposedly can press the “L2” button to automatically center on the enemy, but I’ve found it to be hit or miss, especially when you’re surrounded). To sum up, I’d give the Playstation Move implementation a solid 5 of 5, the graphics a 4.5 of 5, the exercise value a 3 of 5, and the entertainment value (i.e. the storyline) a 2 of 5. In short, I’ll give the overall game a 3.5 of 5…not a game you’ll necessarily want to rush out and get solely because you’re a fan of any of the franchises, but certainly a fun set of mini-games to play in a party setting to show off your Playstation Move.